I’m a fan of bell hooks’s picture books, especially those illustrated by Chris Raschka. I did a bell hooks program in February using Be Boy Buzz, Skin Again, and Happy to Be Nappy. I think the illustrations are wonderful and they are lyrical stories. They can be tricky for read-alouds unless you read them with a lyrical tone and act out some of the emotions. Some of my kids loved the books, some of them didn’t. 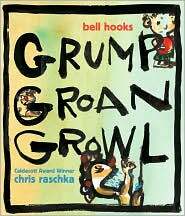 Her new collaboration with Raschka, Grump Groan Growl, focuses on Bad Moods. The illustrations really match the emotions, but I think it would definitely need an over-the-top performance and lots of interaction from the kids for a storytime. But that makes for great discussions and responses from the kids. I could see myself stopping on almost every page to ask the kids what the picture reminds them of, how they feel when they’re in a bad mood, what colors remind them of bad moods. It’s a great book for a program or lesson on emotions, but the illustrations are abstract and would benefit from lots of interaction.